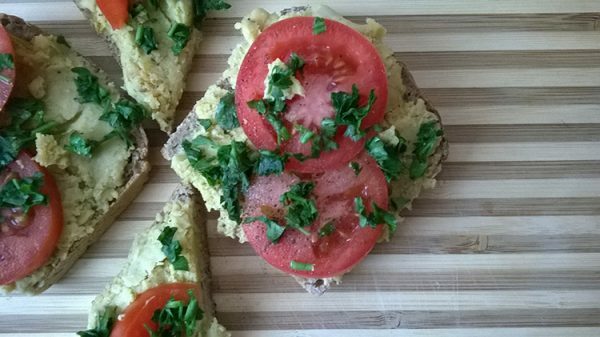 A versatile tasty spread you can prepare in advance as a snack and eat hot or cold on top of bread, crackers or as a side. Place the chickpeas in a colander and rinse. Leave in pot with water for few hours or overnight. Afterwards change water and cook for 1 – 2 hours. Once chickpeas are cooked, strain the water and add 45 ml of oil and a teaspoon of your chosen spices. Add a pinch of sugar and leave it covered to marinate. Boil the potatoes and courgettes until cooked. Blend all cooked ingredients in a food processor. Check the taste of the mixture, it may be necessary to add more spices for a better taste. Put the blended vegetable spread in a dish and bake at 150ºC for 40 minutes. Garnish vegetable spread on bread or crackers with cheese, tomato and coriander or any other fresh herb you like and enjoy.